Lake Titicaca is one of the highest in land lakes in the South America if not the world and should be part of any adventure to Peru. Therefore, you might be thinking where is Lake Titicaca located. The lake is located on the border between Peru and Bolivia. It measures 194 kilometers long and 65 kilometers wide. The lake occupies 8710 square kilometers with 5260 in Peru and 3450 in Bolivia. The maximum depth of the lake is 281 meters deep. 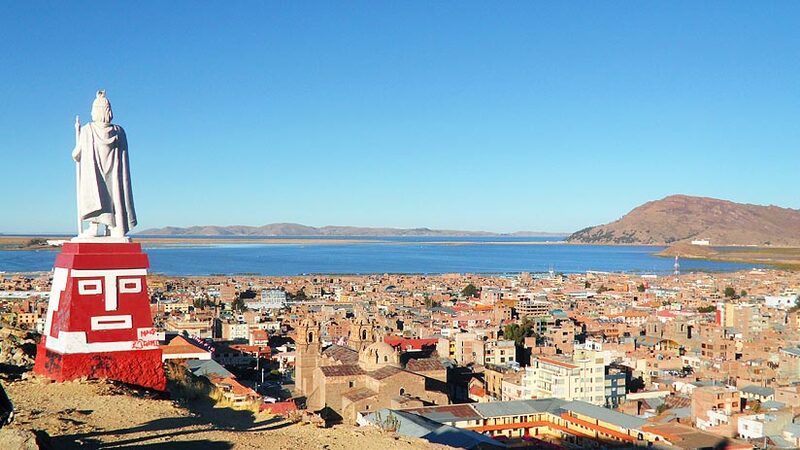 On the shores of Lake Titicaca are many towns where you can stay. The main town of the Peru side is Puno. Puno is the starting point for tours to the lake and has many hotels to stay. The town has a charming Plaza that features a colonial style church. 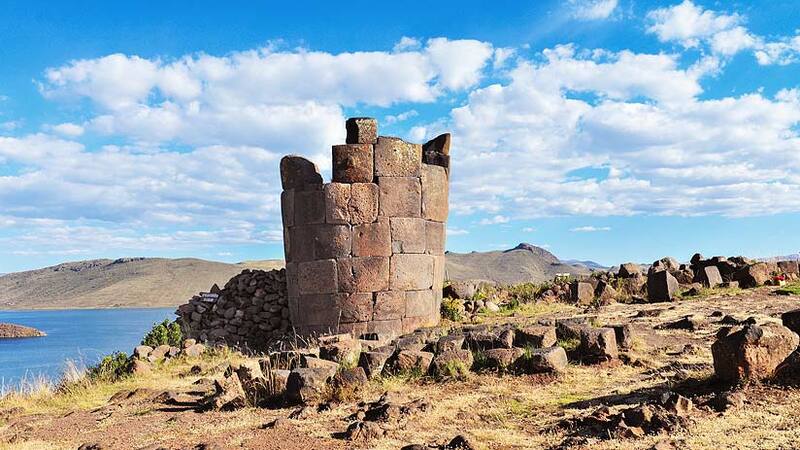 Just outside of Puno are the towers of Sillustani, also on the shores of Lake Titicaca, these funeral towers have an interesting history. Take a tour from Puno and if you go in the afternoon make sure you take a jacket, as it gets very cold. The Lake area offers an extraordinary amount of fauna including, ducks, many different varieties of fish and on the mainland surrounding the lake many Llama and Alpaca. Every year in February the town’s population explodes when the Festival of the Virgen de Candelarbia takes place. Dancers and Musician come from all over Peru to take part in the street parades. 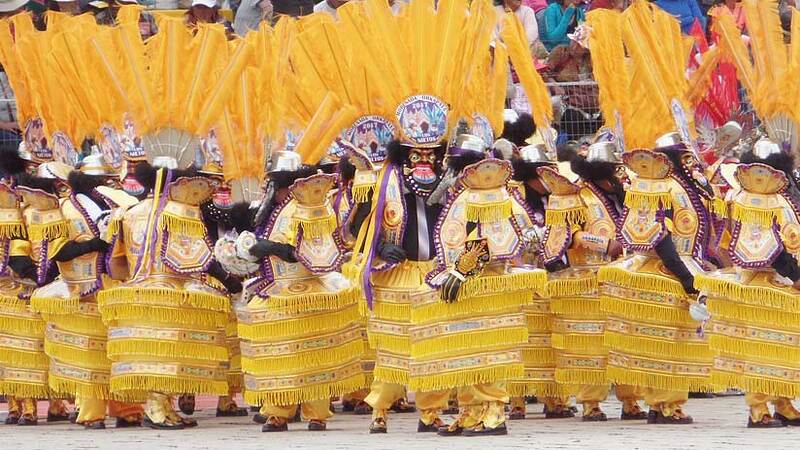 The parades feature dances from different parts of Peru and all are accompanied by brass band. The dancers themselves are dressed in traditional costumes making for a colorful spectacle. There is something to see most of the month of February in Puno. 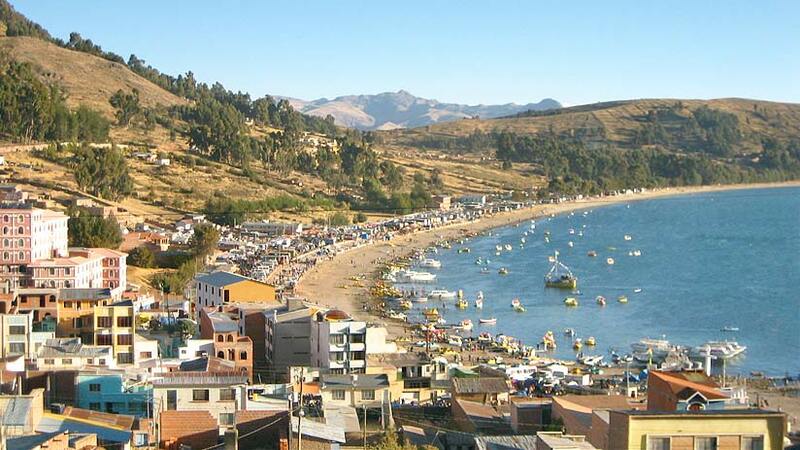 On the Bolivian side, the major town on the shores of Lake Titicaca is Copacabana. This very charming little town is famous not only for being on the shores of the lake but also for its large white church that dominates the town. There are also some charming restaurants and you can take out paddleboats on the lake. The weather in Copacabana is warm and sunny and it is a perfect spot to spend a few days. There are many important islands on the Peruvian side of the Lake with the biggest tourist attraction being the Uros Islands. These islands are made completely of reeds that grow locally in the lake. The islands are inhabited by the Uros people who have lived here for hundreds of years. 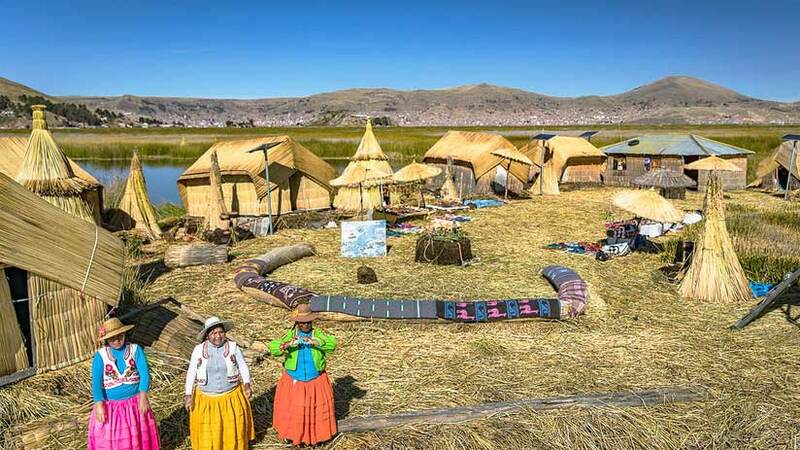 A visit to the Uros Islands is quiet special as there is nothing else like them on the planet. See how the people live their lives and incredibly, they are mainly self-sufficient. Tourism play a large part of their lives and the local people use tourism as a source of income. Further out on the lake are the rock islands of Amantani and Taquille. Both islands have local communities that you can visit. These local communities also make a living from tourism selling the beautiful handmade knit wear on sale in the villages of both islands. Neither island have cars so you will have to walk everywhere that you go, without cars, the islands have a lovely peaceful atmosphere. On the Bolivian side of the lake are two very special islands to visit, the Sun and the Moon Islands. These islands have a total of over 180 Inca ruins, which make them worth a visit; again, there are no cars so you will have to travel around the islands on foot. There is basic accommodation on the islands if you want to stay with a local family. 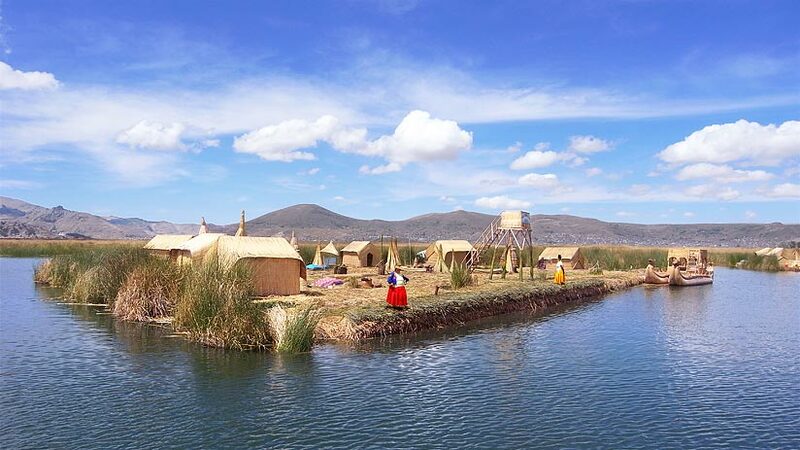 Lake Titicaca was a scared place for the Inca civilization, Inca legend has it that this is where the world was created, the god Viracocha came out of the lake and created the sun, the stars and the people. Where is Lake Titicaca you may want to travel from Machu Picchu to Lake Titicaca and are wondering how you will get there. There are several ways to get from the Imperial City of Cusco, the closest city to Machu Picchu, to Puno and the first and most luxurious is to take the luxurious train over the high plains to Puno. The train takes around 10 hours but the scenery is spectacular. Pass the Andes Mountain range complete with snowcapped mountains and quaint little villages. The next way is by bus. There are many different bus companies from which you can buy your bus ticket. From the basic to the luxury, a bus trip will take you around six hours from Cusco. Coming from Lima there are flights daily to Juliaca, which is around a 40-minute drive from Puno. Be careful arriving directly from sea level to the altitude of Puno you will need to rest and drink plenty of fluid. 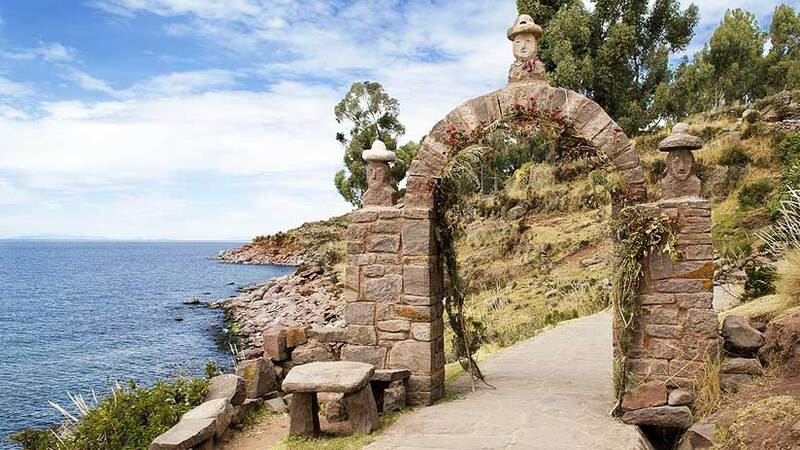 You may have heard of the Lake Titicaca Mystery, the lake has many mysteries and legends to hear about on your guided tour. Do some research on where Lake Titicaca is located and discover all the mystery of this fascinating and mysterious part of Peru. Travel To Peru family vacations. permalink.